OFF TO THE RACES: Can anyone trump Trump? A new CNN poll shows Trump with his biggest lead yet at 36 percent, with Cruz in second place at 16 percent. The real estate mogul is also viewed by GOP voters as the most electable in November. NBC's Alex Jaffe wraps the sometimes odd appearances of Republican candidates at the RJC. BUSH: "Right to Rise, the “super PAC” supporting Mr. Bush, has produced a 15-minute documentary featuring him and will release it online on Saturday and will later show it on television." 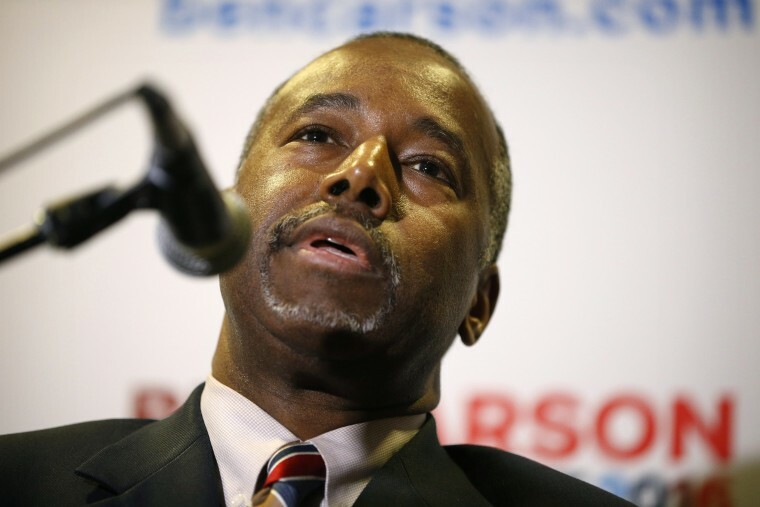 CARSON: He did not exactly wow the crowd at the Republican Jewish Coalition forum. CLINTON: From the New York Times, on Team Clinton and the DNC: "In recent weeks, Mrs. Clinton’s campaign aides have started to scrutinize what have historically been core functions of the party committee, some of which atrophied under President Obama, according to people briefed on the reviews. The reviews have been undertaken at the request of Mrs. Clinton’s campaign manager, Robby Mook, who has taken a particular interest in how the research and communications operations are functioning, according to the people briefed, who asked for anonymity to discuss private deliberations. Among the questions her team is looking at, gingerly, are staffing and dexterity in combating an increasingly unpredictable Republican field." CRUZ: He's rolling out his 'Second Amendment coalition" at a gun range in Iowa. RUBIO: A Washington Post investigation of the period before Rubio's Senate win shows that he used political influence to secure lucrative contracts for his firm. "Rubio’s business deals during the period between his Tallahassee and Washington chapters demonstrated the ways he leveraged his enduring power inside government to make a profit on the outside. And they add to the contradictory picture of his personal finances that has emerged as his presidential campaign has gained traction — of a young man who struggled financially even as his personal income soared along with this political success." Former ed page editor Drew Cline writes in the Union Leader: "Why it has to be Marco Rubio in 2016"
TRUMP: David Brooks is sure Trump won't be the nominee. "The voting booth focuses the mind. The experience is no longer about self-expression and feeling good in the moment. It’s about the finger on the nuclear trigger for the next four years. In an era of high anxiety, I doubt Republican voters will take a flyer on their party’s future — or their country’s future." He'll participate in the CNN debate after all. From the Associated Press: "Donald Trump tapped a man to be a senior business adviser to his real-estate empire even after the man's past involvement in a major mafia-linked stock fraud scheme had become publicly known, according to Associated Press interviews and a review of court records." The New York Times writes that Paul Ryan is "throwing down the gauntlet" as House Speaker and drawing big contrasts between the two parties. NBC's Frank Thorp reports that the Senate has passed (via reconciliation) a bill to repeal much of the Obamacare law and to strip federal funding of Planned Parenthood. It's headed to the House, where it will pass, and on to the White House - where Obama will veto it. And/but: Thorp also writes that the Senate also voted down three pieces of legislation introduced by Democrats that would have strengthened gun and mental health laws. The big picture, from the AP: "The details of the California massacre at a holiday party — pointing at a possible link to Islamic militants and raising questions about domestic extremism — quickly knocked both Republicans and Democrats off their talking points, upending what has become a grim and predictable ritual in American politics." The Washington Post looks at the backlash against American Muslims since the Paris and San Bernardino attacks. The AP has the latest on suspect Syed Farook: "With a young wife, infant daughter and government job, Syed Farook appeared to have arrived at a sweet-spot in life. Friends knew the 28-year-old by his quick smile, his devotion to his Muslim religion and earnest talk about cars he would restore. They didn't know the man authorities say was busy with his wife, Tashfeen Malik, building homemade bombs and stockpiling thousands of rounds of ammunition for a commando-style assault Wednesday on a holiday party of his co-workers that killed 14 and injured 21." *** Friday’s “MSNBC Live with Tamron Hall” line-up: Tamron speaks with Ryan Reyes whose partner Daniel Kaufman was a victim of the San Bernardino shootings; former Los Angeles Mayor Antonio Villaraigosa about California’s gun laws; and NBC’s Kerry Sanders, Pete Williams, Gabe Gutierrez, and Trymaine Lee about the latest updates in San Bernardino. *** Friday’s “Andrea Mitchell Reports” line-up: Today at 12p ET Andrea Mitchell interviews Sen. Barbara Boxer, NBC’s Chuck Todd, LA Times’ Dexter Thomas, and our team of reporters with the latest on the investigation into the shooting rampage in San Bernardino, CA.